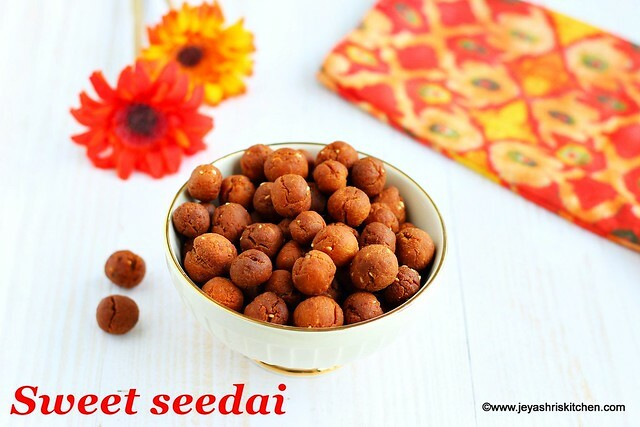 Sweet seedai is a very simple seedai made with wheat flour, sugar and few other easy available ingredients. 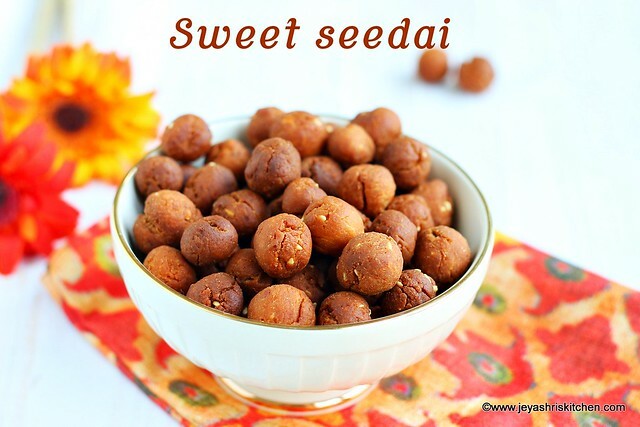 I have posted Vella seedai recipe where we add jaggery for sweetness. For beginners if you are still not confident of the consistency of vella paagu for vella paagu, you can make this sweet seedai. This is a no fail, no burst seedai recipe. I saw this recipe of sweet seedai in a youtube video and made few changes in that. We all loved the sweet seedai. Actually my plan was to post Milagu seedai but unfortunately it popped. I think the home made pepper powder is not so fine and thus this disaster. So found this recipe so easy and attempted it. Check out my full collection of Gokulashtami recipes. Slightly roast the wheat flour, till it gets heat. Do not change the colour. Roast the coconut in a pan till golden brown. Actually in the original recipe it is not mentioned to roast coconut. But i did as we usually do it for vella seedai. In a wide bowl add wheat flour, rice flour ( i used store bought rice flour), coconut, sesame seeds, salt, cardamom powder and butter. Add the powdered sugar to this. Sprinkle milk to this and make a tight dough. Do pour milk at a stretch. The dough should not be too loose. You should be able to make seedai ball. Make small balls out of the dough. Do in batches. Keep it covered all the times. Heat oil and once it becomes hot, bring the flame to small. Add the rolled ball in batches. Only frying takes a bit of time. Once the seedais slightly rises above the oil, keep the oil in medium flame and after 1-2 minutes bring it to low. You adjust the flame everytime so that oil should not get heated up much. If it is cooked in medium flame throughout, it will not get cooked inside and the seedais will not turn out crispy. Once it gains nice brown colour, take it out from oil and drain in the kitchen towel. One batch took 12 - 15 minutes to get fried. Ensure that the wheat flour is not roasted too much. Depending upon the texture of the flour, the quantity of milk may increase of decrease. Sprinkle the milk and make the dough. I felt the sweet is just perfect, but if you want really sweet you can add 1 tblsp extra. If the dough is loose it may happen. I tried for krishna jayanthi this year. It came out sooooooo well.. Every one loved it especially my kid. Thank u so much for the recipe.